This was a grand Seattle wedding where the couple hosted more than 400 guests as well as a 16-person bridal party. 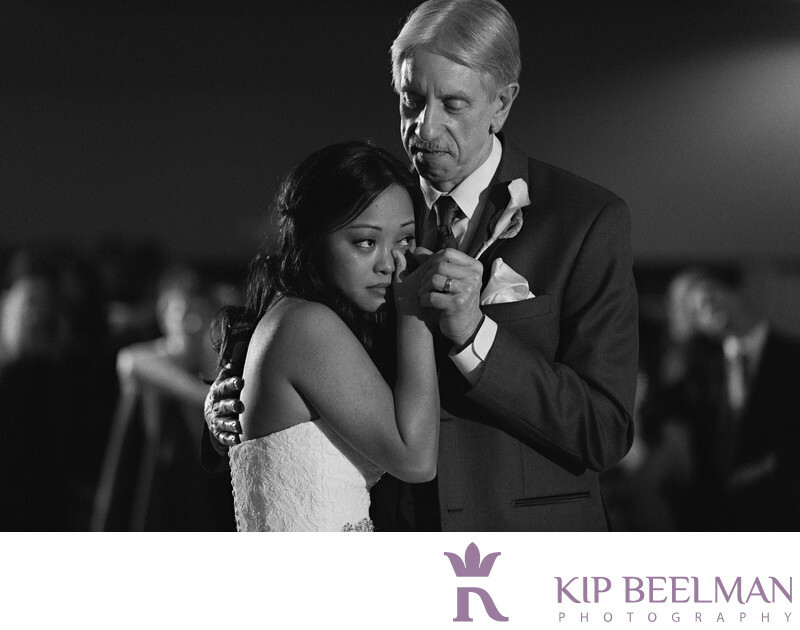 And yet, this image creates a quiet intimacy of a touching moment between dad and daughter. I took it during the father and daughter dance and absolutely love the sculpted light from my off camera lights and the creamy isolation from my 70-200 mm lens. The wedding ceremony was held at the First Free Methodist Church at Seattle Pacific University where the bride's father is a professor, which added an extra layer of significance to the ceremony. Motif Hotel wedding photography offers amazing opportunities such as this to see the bride and groom and their families and friends in a beautiful light and amazing backdrop. The modern, independent Motif Hotel was designed to reflect the culture and energy of Seattle. The upscale hotel includes a fifth floor outdoor deck, sweeping views of the city and beyond, a cultural look and feel, original elements, and a great location just steps away from Seattle’s most exciting attractions, such as Pike Place Market, Pioneer Square, the Space Needle, the Seattle Aquarium the Historic Seattle Waterfront and more. As a wedding photographer, I think that the Motif Hotel is an amazing Seattle wedding photography venue that includes ample space to host events and to create remarkable wedding portraits with really fresh, modern decor. Regardless of the location or occasion, this photo captures a timeless elegance and emotion that I was honored to witness and photograph. Location: 1415 5th Ave, Seattle, WA 98101. Keywords: Church Wedding (21), Hotel Wedding (48), Motif (3), Seattle (111).